Headed down to Spitchwick with Yaara for a Friday evening swim: the perfect thing after an increasingly sweaty week at work. We blissed out in Lower Corner Pool, the evening sun dappling on the surface, as we swam up and down, and then floated in the silky water. As we swam we chatted about swimming; about how the more you do it, the more pleasure you get, the easier it is to get in every time. The cold ceases to have any meaning. Or perhaps I should say sunflower-tinted goggles. I've been road-testing some new ones, and when I'm wearing them, everything appears so much brighter. They're by Zoggs - not a brand I've tried before for outdoor swimming masks. I've been wearing their Tri Vision mask with "CV lens" for the my last few swims and I love it. CV stands for clear vision, the lenses are tinted and have the most amazing effect, they really intensify the colours around you, everything seems lighter and brighter, which in our climate is a real bonus. Today, swimming in a ca ve in Torquay, I was convinced I could see a shoal of escaped goldfish; the little fishes looked glowingly orange, but Anna, who I was swimming with, assured me they were actually grey! Still, I'm all for psychedelic swimming experiences, and I've been really enjoying the way these goggles increase the vibrancy of everything I see. The mask has slightly smaller lenses than others I've tried, but I found it a better fit, and so far it hasn't let any water in, or steamed up. I've worn it in the sea twice and the river once. Thanks to Simply Swim for letting me try these swimming goggles. We yomped through mud and mire, through tussocks and bogs, to get to the East Dart Waterfall. Larks and swallows swooped overhead; armies of foxgloves nodded as we passed, and the Moor felt more and more remote. When we reached the waterfall there were cries of delight. A sideways curtain of water thundering down a moss-lined chute, ending in a gorgeous oval o f coca-cola coloured water, leading through a narrow channel, to a double infinity pool. We scrambled up the falls, clinging onto the slippery rock faces, before slithering down in the rapids. It sounds like an Enid Blyton adventure and it was. Who needs Kirrin Island when you've got Sugary Cove? We followed steps through the trees down to the hidden beach. 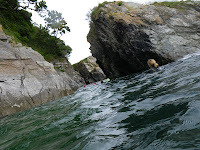 The sea was an incredible pine green, the purple and grey rocks loomed above us, and we set off through the delicious clear water on our adventure. Through a parting in the rocks we glimpsed a secret tunnel, leading to the next cove, and swam through it, a deep chasm, like travelling through a watery corridor. The rock faces below were dramatic, plunging a way into the depths. We arrived at Castle Cove where we found a sea cave with a dark internal pool. No sign of Uncle Quentin's stash though.